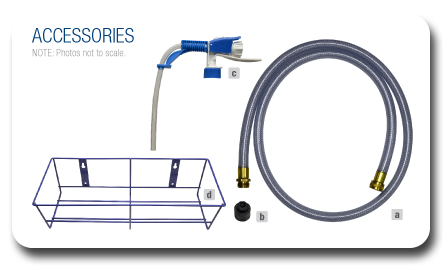 ez2mix is a portable dispensing system that fills ready to use (RTU) spray bottles, mop buckets or auto scrubbers from any standard water hose connection. Unscrew the cap to reveal the SafTflo™ fitment system allows the product to flow through the dispensing unit, providing the right cleaning dilution. 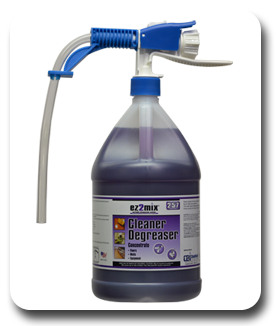 ez2mix will provide you with the complete program with two secondary labels and accessories, a color coded system for easy recognition and icon system indicating proper use. 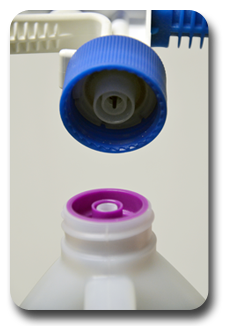 Remove cap from bottle to expose SafTflo™ bottle insert. Place portable dispensing unit onto neck of bottle. Turn the collar on the portable dispensing unit to tighten. Attach your water source to the back of the portable dispensing unit. Depress lever down to begin filling. Release lever when filled to desired level. When finished filling, turn off water. Disconnect the portable dispensing unit from the water source.